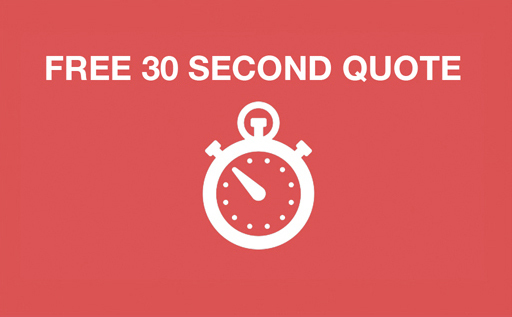 Quotes and free and fast! 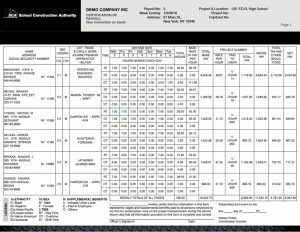 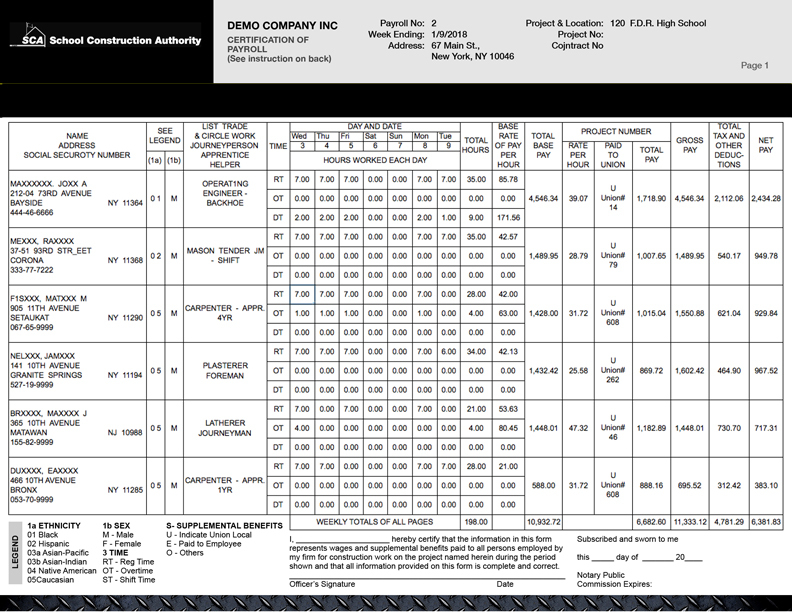 If you have been in the construction industry for any length of time, you know how important it is to have accurate reports and to submit them in a timely manner. 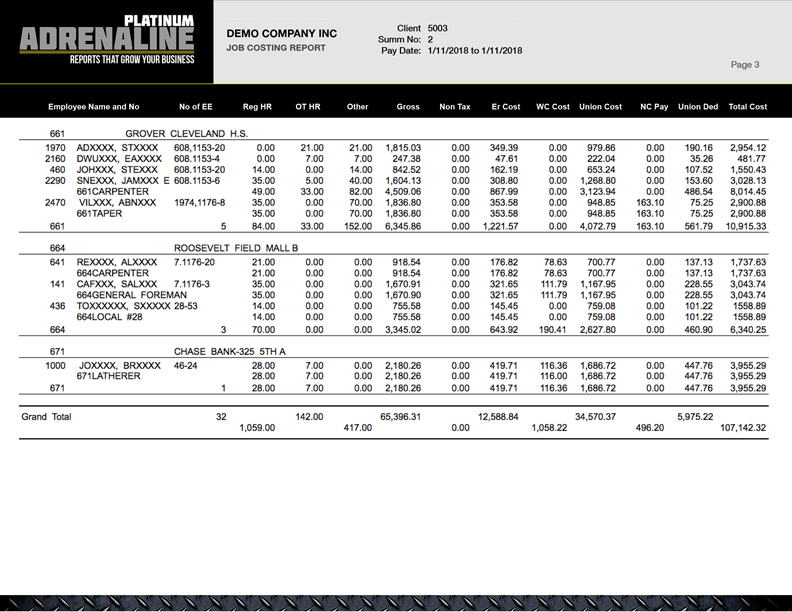 Reports can become complex and tracking all aspects of job costing for union, non-union, and prevailing wage workers is just as essential as getting the job done. 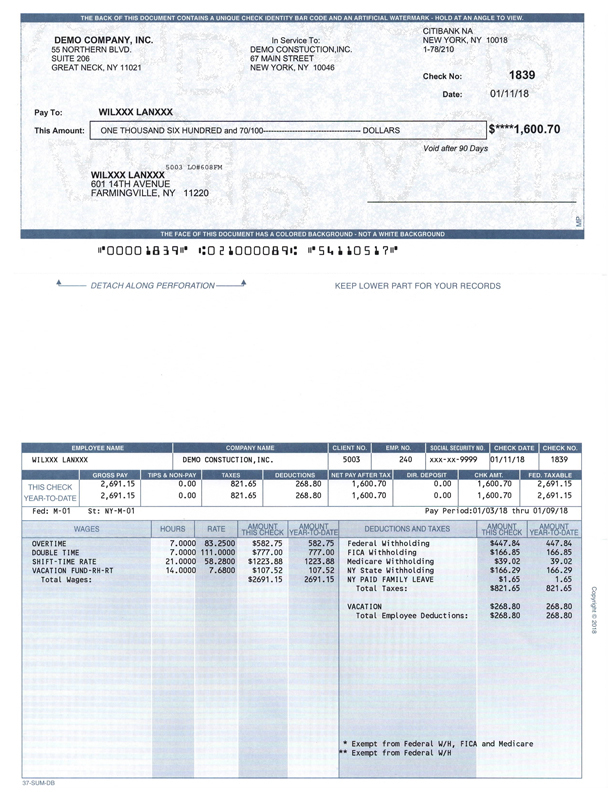 Also as crucial is the correctness and timeliness of certified payroll reports. 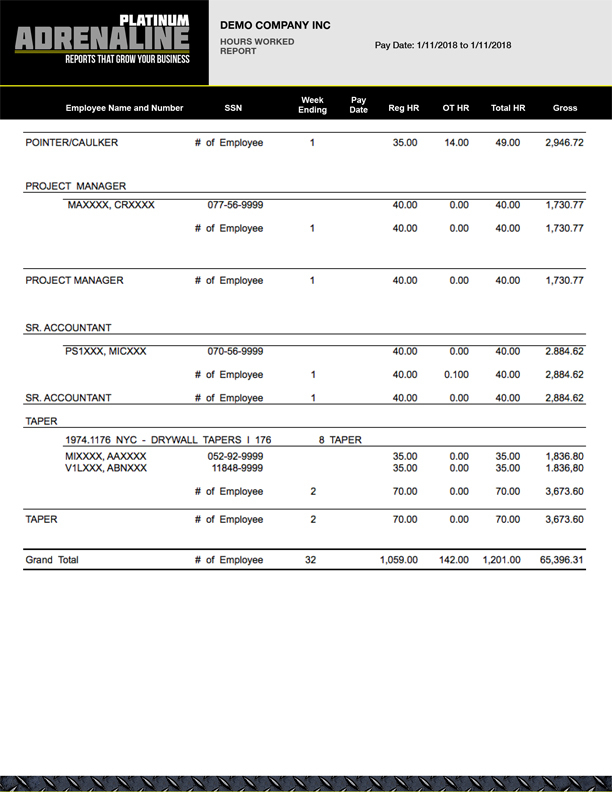 In addition to certified payroll reports, job costing reports, and specific union reports, EEO Minority reports, Workers’ Compensation reports and others are standard. 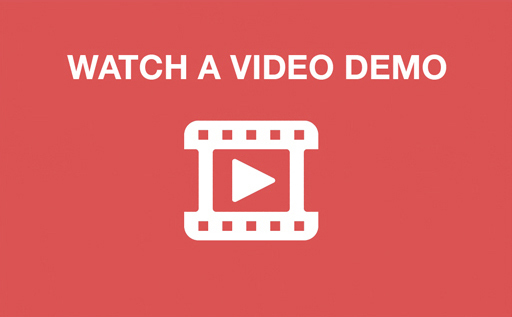 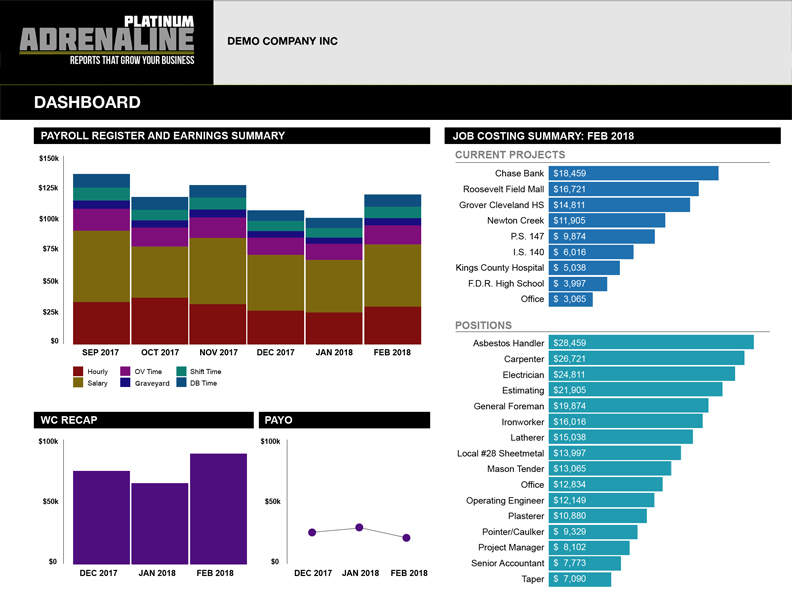 A colorful, easy-to-read dashboard brings your reports and vital info to life, streamlining your data and making it easier to manage your business. 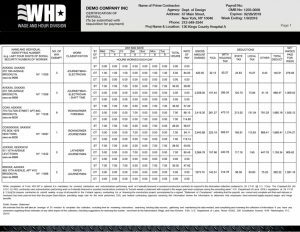 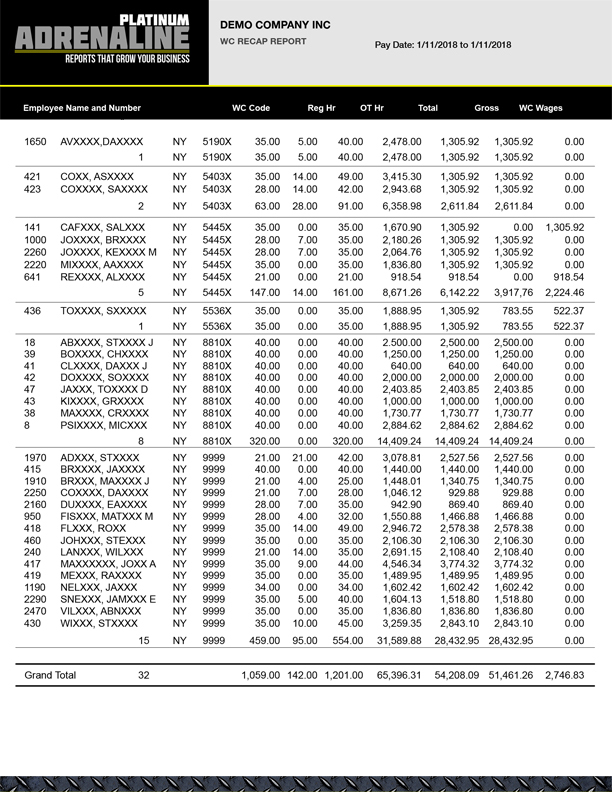 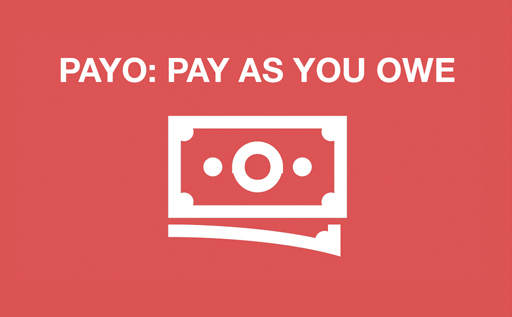 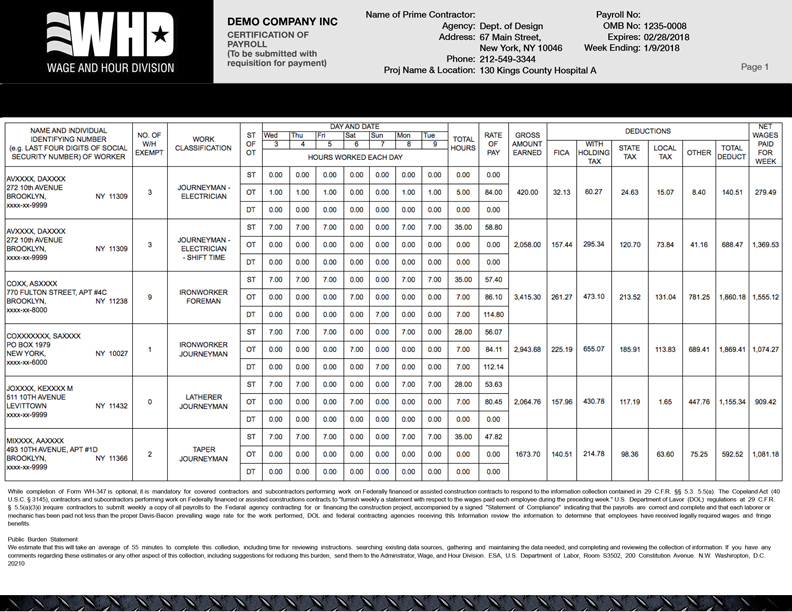 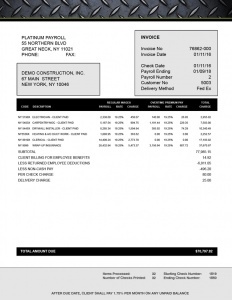 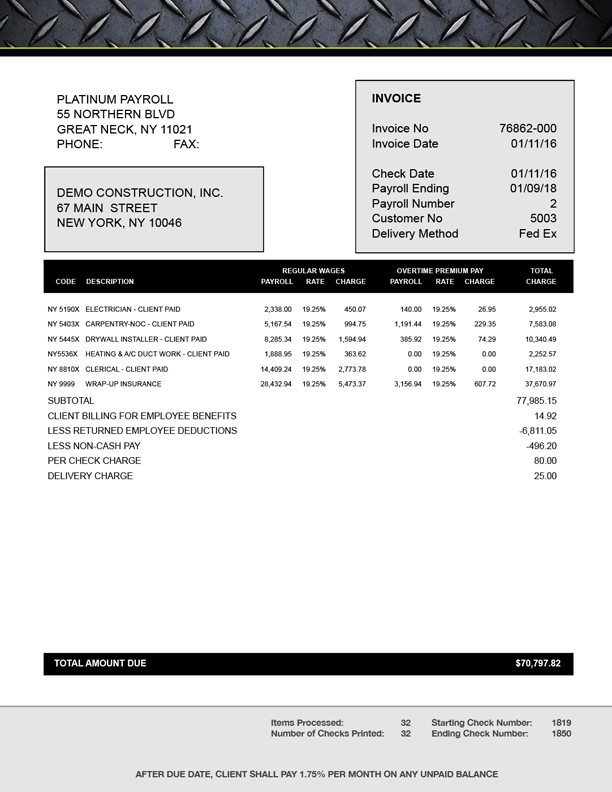 Invoices are detailed and itemized, broken down for ease of understanding. 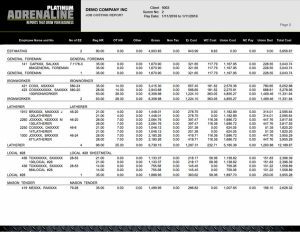 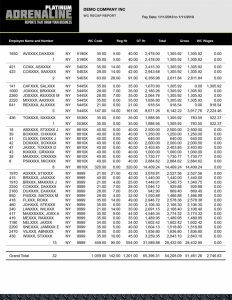 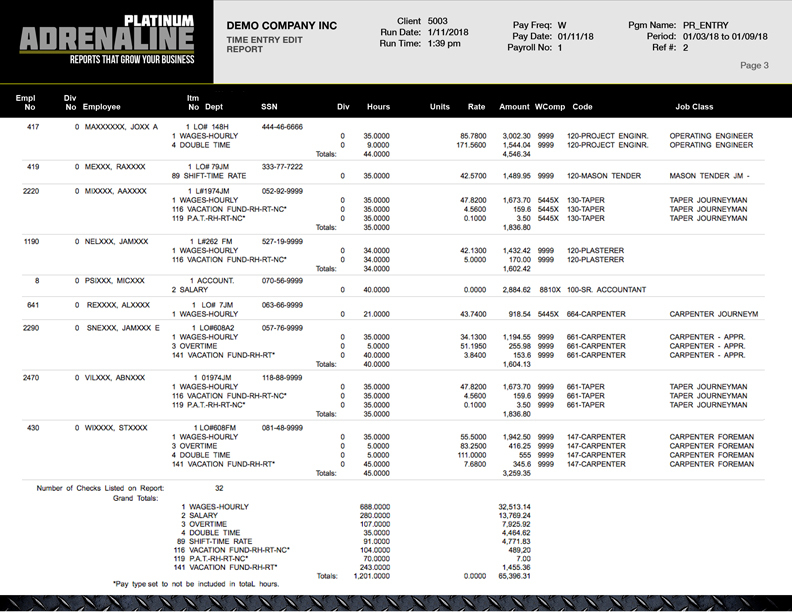 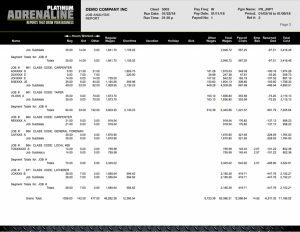 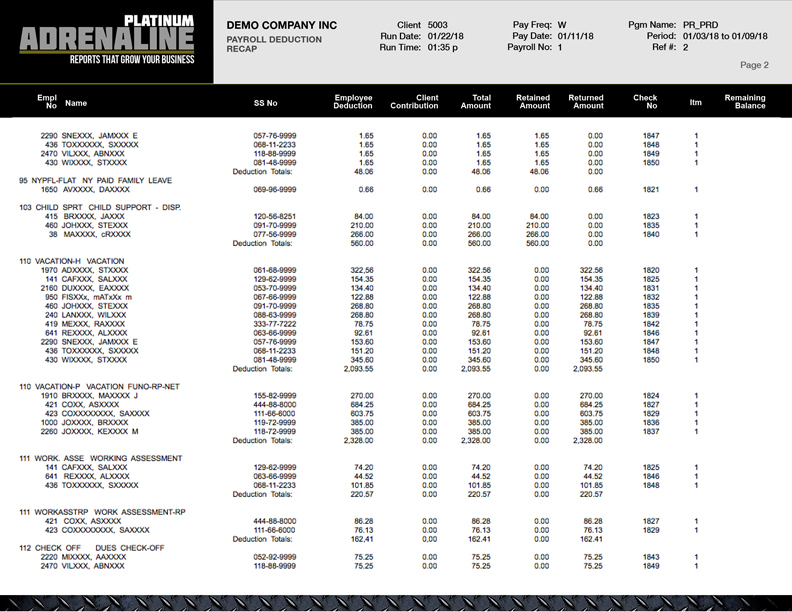 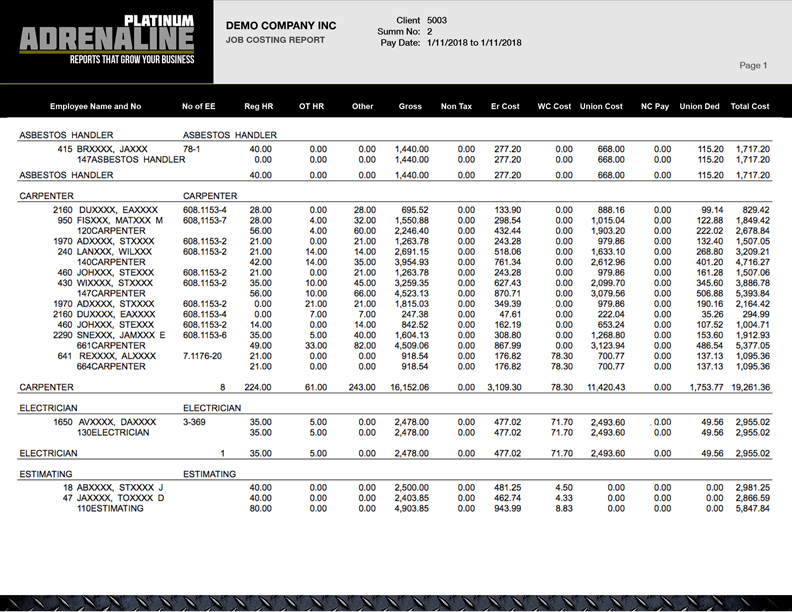 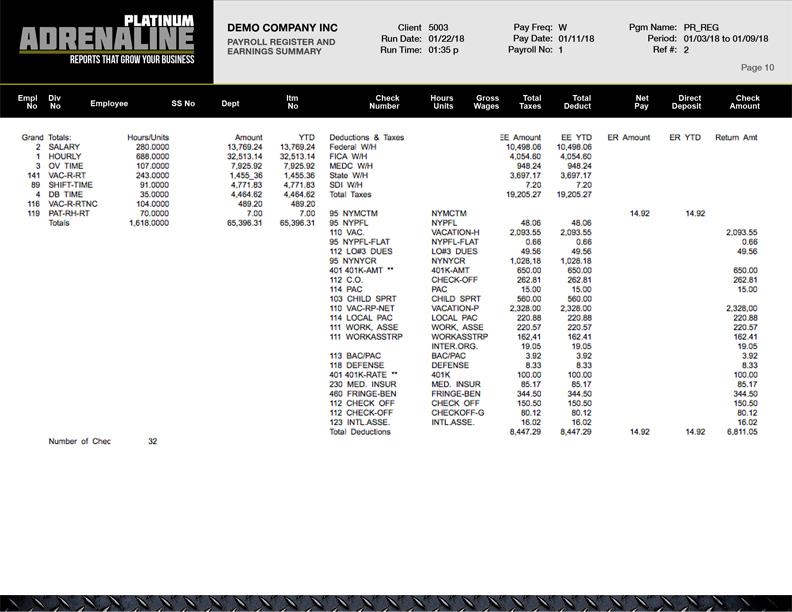 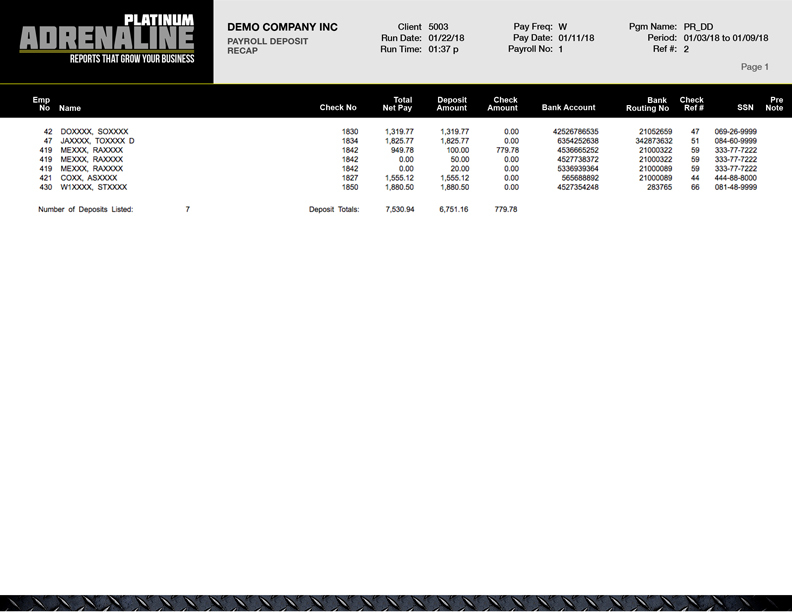 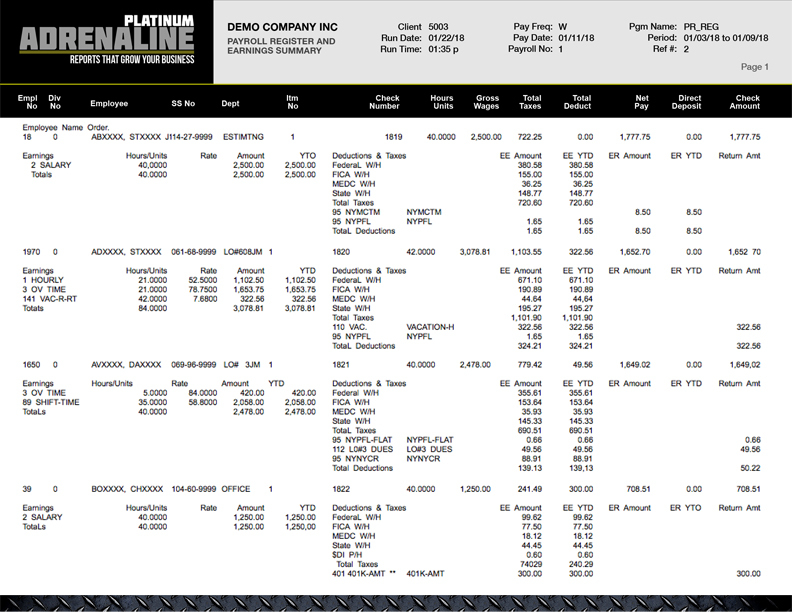 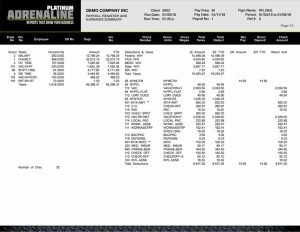 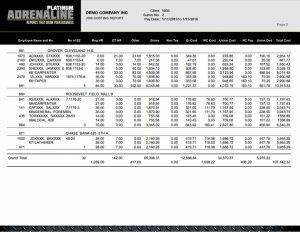 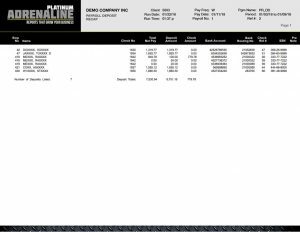 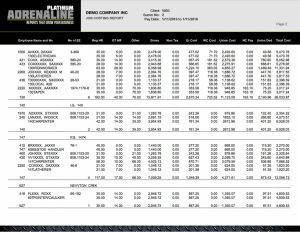 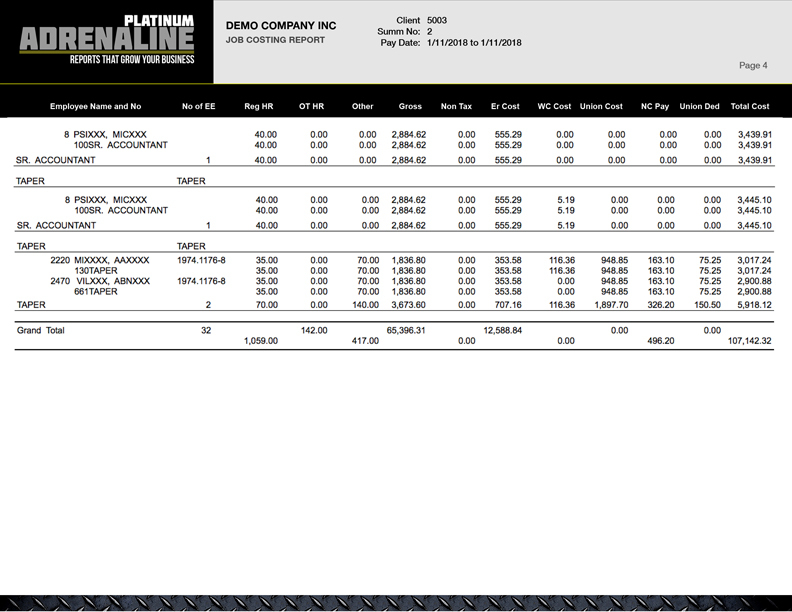 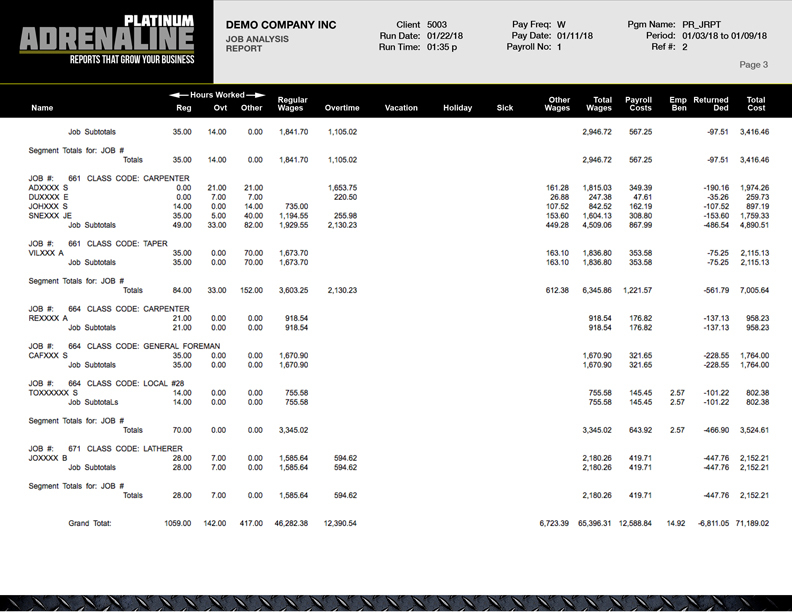 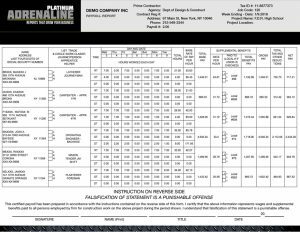 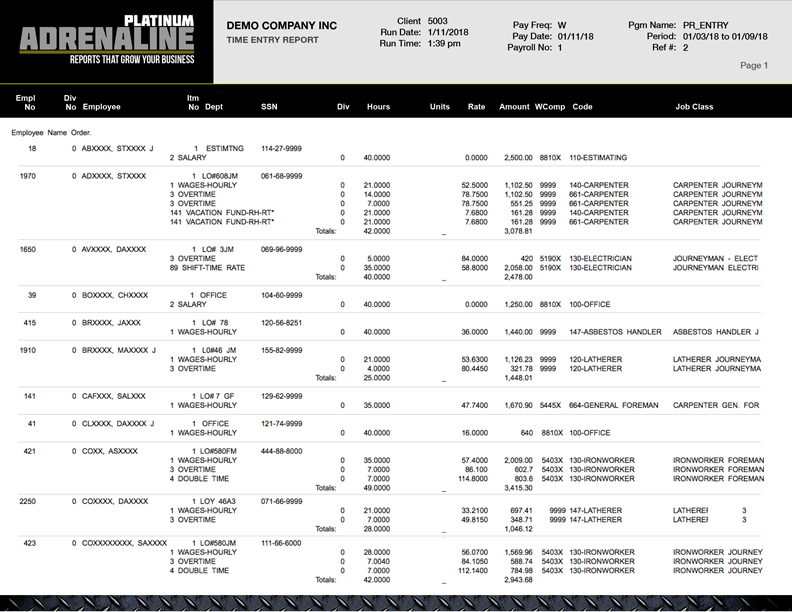 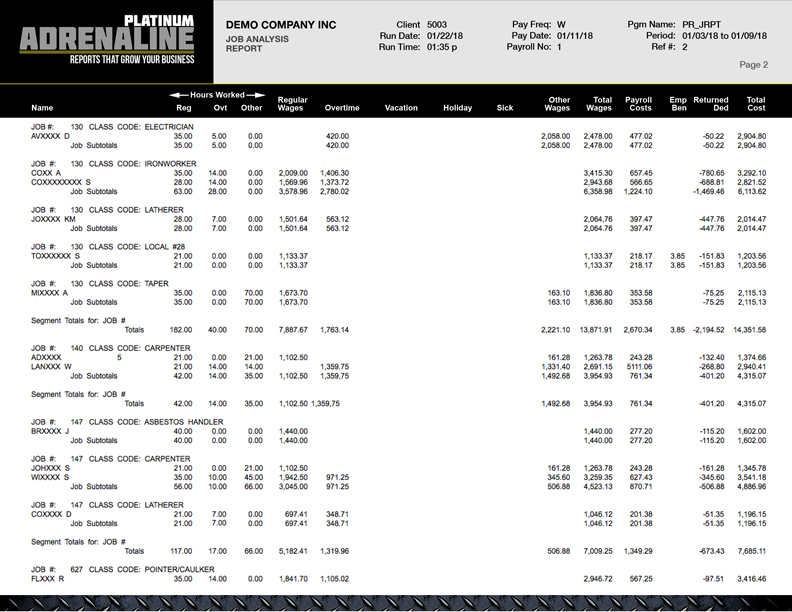 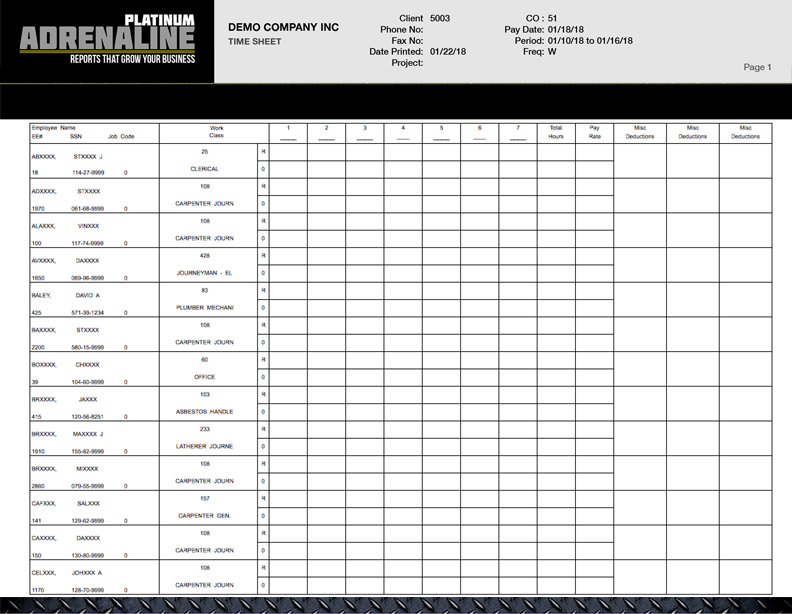 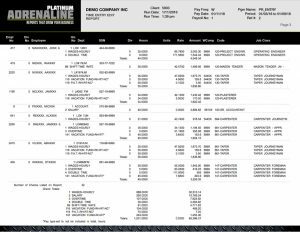 Platinum’s payroll register and earnings summary provides a simple, concise accounting of earnings and tax information, broken down per employee. 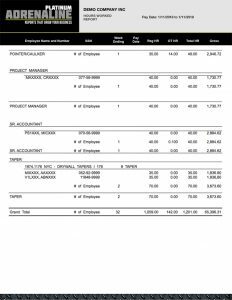 The payroll deduction report helps to easily track deduction-related data, conveniently filtered by individual employee, as well as deduction category. 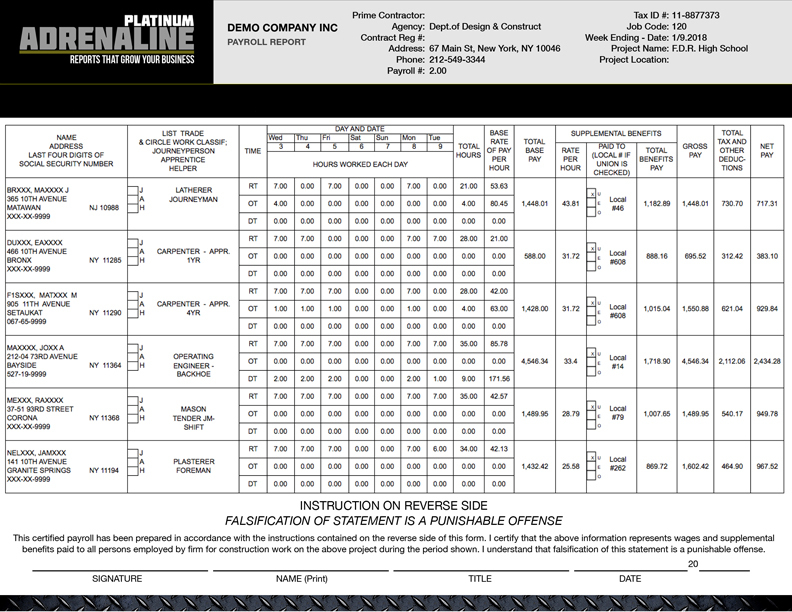 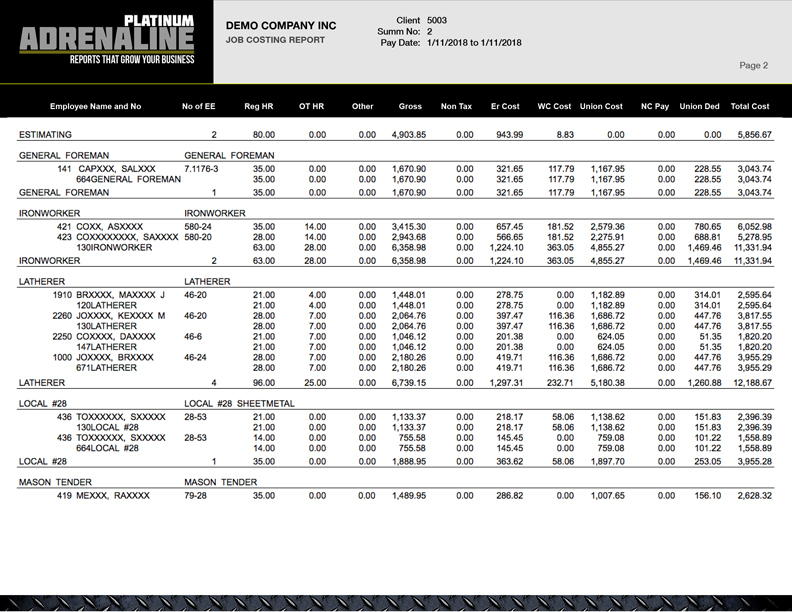 Platinum’s job analysis report breaks down your costs per trade, so you can quickly and easily understand which positions account for your highest expenses. 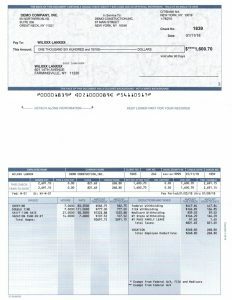 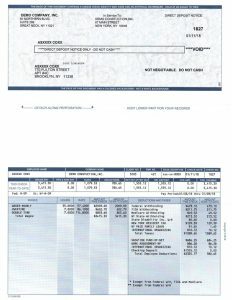 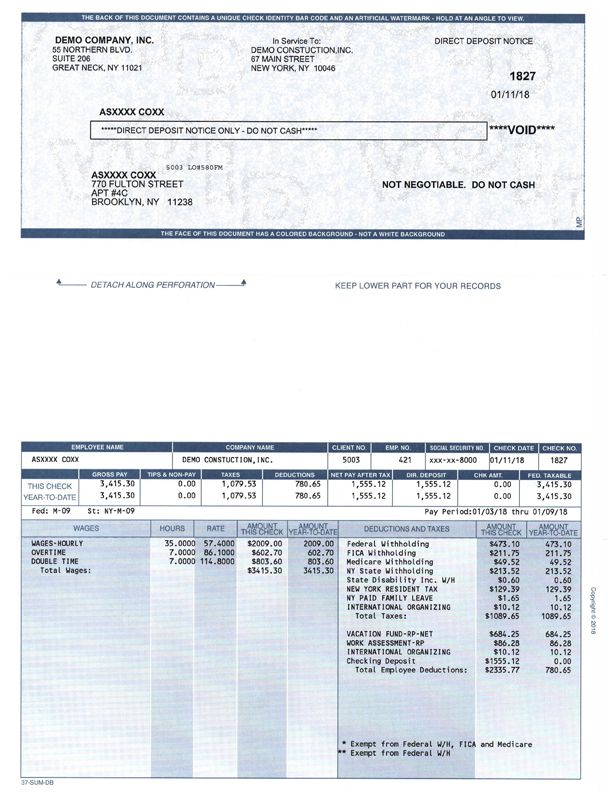 A sample voided check provided with all direct deposits, along with a fully details recap report. 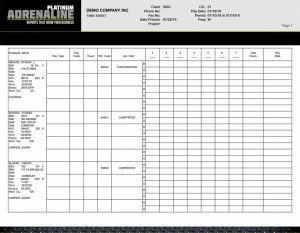 Our time entry report showcases all of the hours each employee has worked in a given period, broken down for easy accountability. This report provides a breakdown of hours worked per employee and their trade. We provide multiple job costing reports, including one that breaks expenses down by job location. 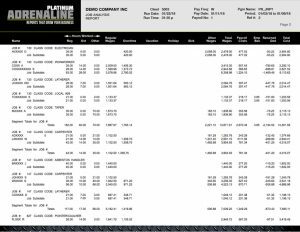 Platinum’s workers’ comp report is a comprehensive analysis of all employees, and their workers’ compensation contributions.